Yo to challenge for Judan: The first semifinal in the 55th Judan tournament was held on December 26. Imamura Toshiya 9P (B) beat Hane Naoki 9P by resig. The second was held on January 9. Yo Seiki (Yu Zhengqi in Pinyin) (W) beat Yamashita Keigo 9P by 1.5 points. This was a lucky win for Yo (right). When the micro-endgame started, Yamashita was half a point ahead, but he played an invalid ko threat that cost him a point and a move. This meant that the final to decide the challenger was an all-Kansai Ki-in affair for only the second time in the history of this tournament (the first time was Sonoda Yuichi vs. Yuki Satoshi in the 27th Judan). The play-off was held on January 26 and the result couldn’t have been closer. After 317 moves, Yo edged Imamura by half a point. This gives Yo another crack at an Iyama-held title. The first game will be played on March 7. Meijin League: The first league games of the new year were played on January 11. 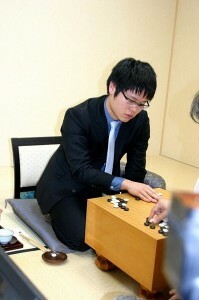 Yamashita Keigo 9P (W) beat Sakai Hideyuki 8P by resig. ; Cho U 9P (W) beat Hane Naoki 9P by resig. (January 19) Murakawa Daisuke 8P (W) beat Yo Seiki 7P by resig. (January 26). Iyama Yuta (W) beat Ko Iso 8P by resig. This game was decided in 104 moves. 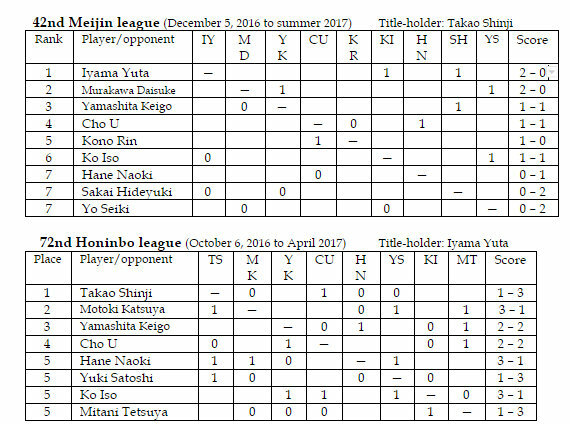 There’s little doubt that Iyama is the overwhelming favorite in the league, though he shares the lead after two rounds with Murakawa. Yuki Satoshi 9P by resig. On January 19, Yamashita Keigo 9P (B) beat Hane Naoki 9P by resig. Hane’s loss meant there was now no undefeated player in the league. On 3-1, Hane shares the lead with Motoki and Ko Iso. On January 26, Takao Shinji Meijin finally picked up his first win in the fourth round when, taking white, he beat Cho U 9P by resig. Cho is now 2-2.